Well here we are, the eve of the month, that for so many fashion gurus and queens , have planed their whole year around. In fact, to the small group of us that heard this was in the works, the wait spans way more than just a mere year. As Dallasonians, we are all very proud and honored to have on our hands, a celebration of fashion, that will officially solidify us among one of the largest Fashion capitals. As the Countdown begins in our humble and a tad holier than thou city, we celebrate the person behind some of the most provocative and evocative looks that shook Pop Culture to its very core. Unlike that last celebrated and unprecedented Exhibit of our time, in New York “this couturier is still living”. In fact our blessed viewing, is set to rival that very exhibit. As every major and non major publication in our City are servicing with their own words, they all cant help but serve as a master Preface to a stage being set, that come November 13th every local fashionista will conclave at The Dallas Museum of Art, to pay our living respects to the Master of Couture. 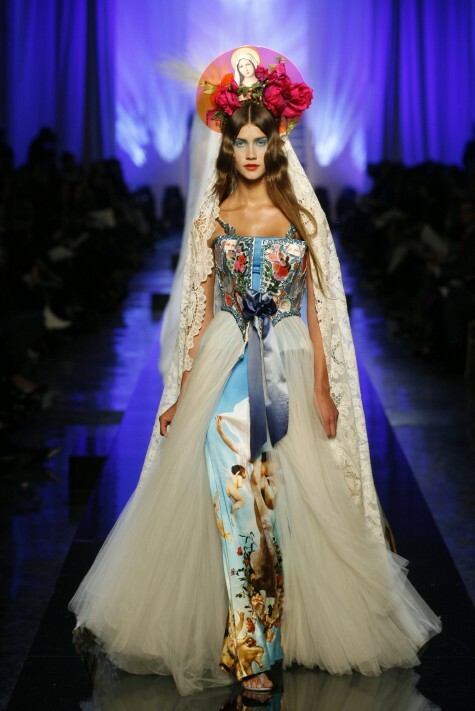 The Fashion World of Jean Paul Gaultier: From the Sidewalk to the Catwalk, will be the biggest thing in our parts. The month of November will undoubtably be a busy month for the Dallas social scene. Much like the couturier himself, Dallas will be transformed into a social fashion world all focused on the collective works of man who embodied Pop culture. Jean Paul Gaultier, has dressed many of the worlds leading women and men, in fact the pieces that have been worn by our celebrated icons have become more recognizable than the people who embodied them. Such as the Blonde Ambition Tour Costumes, who can forget Madonna’s array of Gaultier creations, truth be told, his creations gave the world the most recognizable and iconic image of Madonna, that practically defined her shock value career. The history of his genius goes far beyond words, the history of this man will for sure be well represented at The Dallas Museum of Art, however among the local press and the statements of the curators of the Montreal Museum of art, as well as the Dallas Museum of Art , all have stated that rather than just a retrospect of career, this is an exhibition of contemporary Art through fashion. In fact the November issue of Arts & Culture | Dallas Ft. Worth highlights the long debate the world has had between fashion vs. art and in this case, fashion as art. It’s Very thrilling to see fashion play out in this manner, this very concept and debate is always fuel to artistic intellect, it all makes for a sure hit in the world of art and fashion, and says so much about our beloved city which is playing host to an epic exhibit. The Dallas Museum of Arts’ Exhibit on Gauliter is buzzing so much, that in fact it may be dwarfing yet another Epic and only U.S. presentation, CARAVAGGIO And His Followers in Rome at The Kembell Art Museum, This stands be such a major moment in DFW Art for sure, Gaultier and Caravaggio in the same metro, WOW, is the only fitting word. If you’re a social butterfly in our neck of the woods, get ready! The Fashion World of Jean Paul Gaultier: From the Sidewalk to the Catwalk is set to trigger a chain of events around town. Among the most notable are actually takeing place in the coming week. Get your mouse trigger ready for the links below, and see what is to come, tickets have been on sale, you can stop in at the Dallas Museum of Art or visit the NorthPark Center to purchase tickets at the Arts and Culture desk. The Fashion World of Jean Paul Gaultier: From the Sidewalk to the Catwalk is making for a crazy ride. Might I add a special soon to be product that will for sure make my ObsesSEAN List. The Exhibit catalogue will make for a perfect stocking stuffer, or maybe not ,considering that its said to weigh more than 10+ pounds. What a time for Dallas, and hope to see every there. (Click Away) For all special events (some invitation only) for The Fashion World of Jean Paul Gaultier: From the Sidewalk to the Catwalk visit The Dallas Museum of Art list of special events , regarding the committee luncheons and more, also catch Fashion Group International’s Opening Reception December 1st, and check back for more events, which im sure will be popping up around town until the Exhibit’s conclusion in February. A Taste of Whats to come, a look inside The Fashion World of Jean Paul Gaultier: From the Sidewalk to the Catwalk at The Montreal Museum of Fine Arts. This entry was posted in | and tagged art, Contemporary Art, Couture, DALLAS, fashion, French, gaultier, jean paul gaultier, Montreal, Paris, The dallas museum of art. Bookmark the permalink.